Rio Salado College | RioNews: Free Job Fair - Nov. 15 at Rio Downtown! Free Job Fair - Nov. 15 at Rio Downtown! Looking for a job? 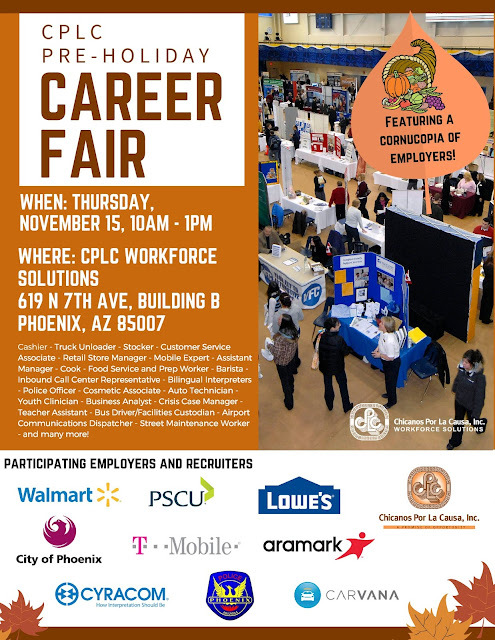 Join Chicanos Por La Causa (CPLC) Workforce Solutions for a Pre-Holiday Career Fair in Phoenix, November 15! Participating employers include Walmart, PSCU, Lowe's, CPLC, City of Phoenix, T-Mobile, Aramark, Cyracom, Phoenix Police Department, Carvana and many more.